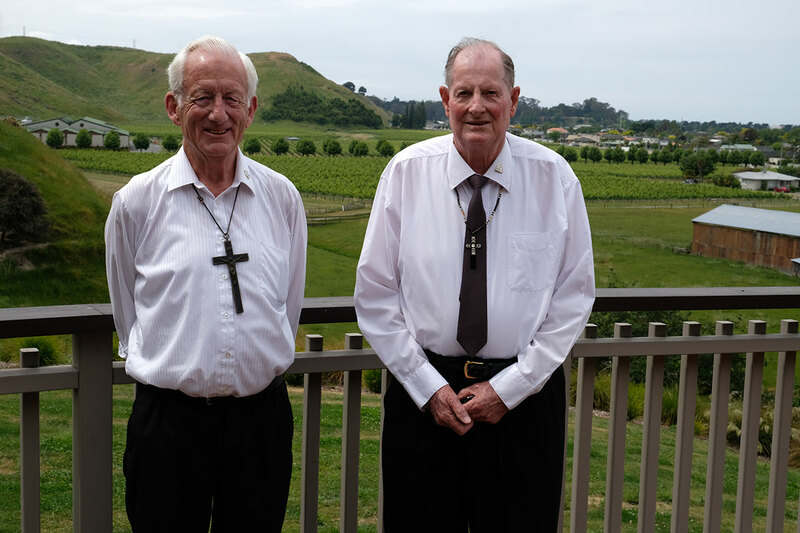 At St Mary’s Church, Napier, on the Feast of the Assumption, a Jubilee celebration was held for Br Bill Archer sm and Br Ray Kelleher sm to mark their 60th anniversaries as Religious. Brs Bill and Ray received candles and renewed their vows. Fr John Mori sm led the concelebrated Mass with other Marist priests from Napier and Wairoa. Marist Brothers were also present. I was born in 1938 in Oamaru and educated at St Joseph’s School in Ashburton and St Kevin’s College in Oamaru. I went to Holy Name Seminary from 1951 to 1955. The story of Fr Emmett McHardy’s life of service in the Solomon Islands caused a major shift in my call to serve the Church. In 1956, I entered the Novitiate and later spent time at Futuna in Wellington. I returned to Greenmeadows and worked in the carpenter’s shop, the winery and gained my Lab-Tech Certificate. Teaching then became my mission for 23 years. Time at Mt St Mary’s Theological College in Auckland and in the Cook Islands followed – a wonderful experience repairing buildings and schools. Returning to New Zealand I was national co-ordinator for Marist schools. I am enjoying retired life in sunny Hawke’s Bay. Through my mother Margaret, my teachers and their support of overseas missionaries, I felt God was calling me to become a Catechist Brother. In 1956 Br Ray and I joined the Marist Brothers at the seminary in Napier. In 1963 I went to Bougainville in PNG and for 15 years I worked as a carpenter and trade teacher, building churches, a convent and a hospital. In 1979, after a year’s study in Sydney, I finally became a Catechist Brother. In 1988 the ‘Bougainville Conflict’ broke out and, after a short time in Rome, I returned to New Zealand. On my return I did pastoral work and now help out as ‘minister of hospitality’. I thank God for my vocation, my fellow Marists with whom I work and pray, and the parishioners of Napier parish. People still pray for me for which I am truly grateful.